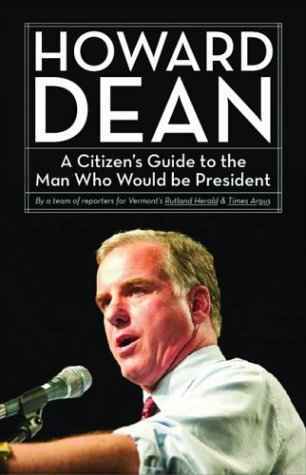 Click here for 28 full quotes from Howard Dean in the book Citizen's Guide to Howard Dean. Retired VT's debt and built nation's best rainy day fund. Kept GOP predecessor�s agenda of fiscal frugality. Gay rights are a matter of principle. Black roommate at Yale defined his views on tolerance. Opposed capital punishment but shifted beginning in 1994. High national standards but local sanctions for failure. Dean�s other landmark VT bill: education finance. Wind energy reduces global warming & reduces Saudi imports. 10% ethanol in gasoline reduced oil imports by 5%. 470,000 conservation acres, but many development deals too. Make trade-offs on environmental protection vs. development. Dean�s first campaign in 1982 focused on bicycle paths. Agrees on some issues with NRA, but some gun control. Supported single-payer in 1980s, but multi-payer in 1990s. If you want total healthcare reform, I�m not your guy. Realign defense funds away from Star Wars. Trade unions gave us our middle class. Models his candidacy on Harry S Truman. Dean surge spawned Clark as Anybody-But-Dean. Dean fueled by large dissident group of Bush haters. Dean�s forthrightness differs from Dem party calculatedness. Liberal in attitude, not in policy positions. Propelled to public service by death of his brother? Rescind all of the Bush tax cuts, to balance budget. Better off with government services than with a $650 tax cut. Evenhandedness in Israel doesn�t imply cater to Palestinians. Implemented VT workfare program along Clinton's lines. The above quotations are from Howard Dean: A Citizen's Guide to the Man Who Would be President, by a team of reporters for Vermont's Rutland Herald and Times-Argus.